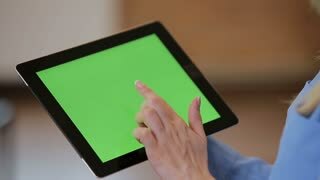 Close up of young atractive woman using black tablet with green screen at modern office. Camera stabilizer shot. Chroma key. Young atractive woman using black tablet with green screen at modern office. Camera stabilizer shot. 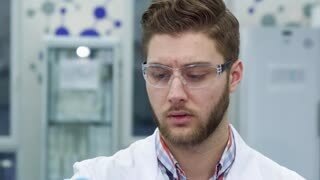 Close up of young atractive woman using black tablet at modern office. Atractive Aframerican businessman celebrating promotion with funny dance walk. Successful boss in modern office 4K slow motion. Young atractive natural Brunette Girl finds a red blouse on the rack in a boutique store and tries it on, and looks in the mirror. Portrait of atractive strange model in white clothing and in white hat indoor. Portrait of atractive blonde model with blue eyes in antique clothing. Atractive entrepreneur unpacking box with docs and digital pad, his colleagues walking near in modern office with huge windows and amazing view to business district. Daylight. Slow motion.